← Are weekends bad for writers? In all my ideas about how to jump-start my writing again, I forgot to notice that I hadn’t been reading much fiction in the past six months. I read blog posts all the time and articles, and lots of non-fiction. Well I finally read a book that jolted me back into the creative flow by the sheer force of its appeal to me and I’d like to recommend it to you. The House Girl turned out to be a wonderful surprise. I fell for the modern day story of Lina, a flourishing young attorney, struggling to make sense of her past and to achieve her lofty goals in New York City. Mix that storyline in with a legal case that takes Lina to doing a kind of ancestry.com kind of search for a possible defendant in a case involving slavery and the emergence of an artistic legacy and wow, I was drawn right into the book. When I originally bought the book, I thought I was going to like it due to the fact that I had just finished reading The Help. I thought it was another dip into Southern culture. We do start the book in the Southern past, with the character Josephine, and the minute she decides she will run from the plantation she works on toward the underground railroad and freedom. But I’m into a modern-day kind of story, so when the book transitions to high-stakes legal offices in early 2000’s Manhattan and into the artistic world of Lina’s dad I found the book even more to my liking. I remained engaged as Lina made discoveries into the past that supported her case as well as made changes in her own life and best of all, I felt that Tara Conklin, a local Seattle writer, ended her book with a true gift to the reader. A totally solid and satisfying conclusion fills up the last pages. I love a modern book with a historical bent and by seeing it done so well, I’m newly inspired to work on my own. 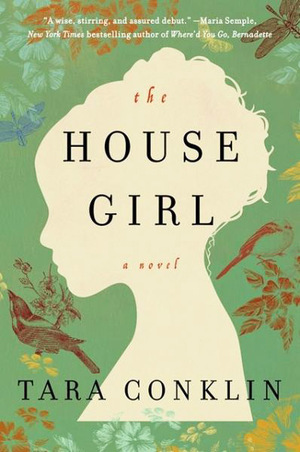 Hopefully, reading The House Girl will have the same inspirational effect upon your writing. This entry was posted in Around Seattle, Janis Wildy book reviews and tagged Books set in New York City, inspiration, local Seattle writer, Seattle writer, Tara Conklin, The House Girl. Bookmark the permalink.